The Christmas in Ida Festival was founded in 1982 by the Ida Civic Club and sponsored by local area service organizations and businesses to share the holiday cheer from small town America. From a small craft show, children's lunch with Santa, and a three-unit parade the festival has become a family tradition and Midwest destination where over 52,000 visitors attend the weekend event. Throughout the years, the festival expanded to include Monroe County's largest indoor craft show located at the Ida Public Schools and Prince of Peace Lutheran Church Hall, and in heated tents in the downtown district where over 150 craft enthusiasts and vendors offer many opportunities for gifts of the season. 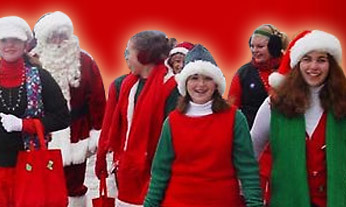 Activities for all ages include Santa's Zoo, Children's Lunch with Santa, ice sculpting, wood carving, ice skating, national and international music entertainment, fireworks, activities at the Ida Library and numerous other events. After several years, the festival presented both a day time and a night parade of lights. After fifteen years, the festival organization opted to put all efforts into the popular Parade of Lights which was fashioned after a parade in the State of Washington, and features the agricultural community and highlighted with parade entries from Michigan, Ohio, Indiana, Missouri, Wisconsin, and Canada illuminated with thousands of Christmas lights. The Parade of Lights is a two and a half hour extravaganza that features over 135 parade units sparkling with thousands of lights including, fire trucks, floats, parade balloons, cartoon characters, bands and marching groups that join farm implements in lighted displays that entertain an estimated 48,000 yearly parade visitors and telecast on cable television and world wide web by MPACT. Presenting the finest entertainment in a wholesome family tradition, the Christmas in Ida Concert Series has presented sensational headliner productions such as country music legends Collin Raye, LITTLE TEXAS, Restless Heart, Keith Anderson, Andy Ross, Josh Gracin, Kelsie May, Kari Lynch, and Shelagh Brown and pop music concerts that featuring the Radio Disney National Tour - Jingle Jam, 2009 Radio Disney Next Big Thing-Jasmine, artists Keke Palmer, Drew Seeley, Everlife, Jump 5, Joey Page, Savvy and Mandy, A Cursive Memory, SAVVY-The Wannabes, Taylor Taylor, New Hollow, and Macy Kate. Regional and international entertainment has included the Boychoir of Ann Arbor, Mosaic Youth Singers of the Mosaic Youth Theatre of Detroit, Saline Fiddlers, Michigan Opera Theatre Children's Chorus, Michigan State University Accafellas, University of Michigan G-Men, Adrian College Choir, and Wayco from South America and several local dance and music groups. Other popular events include the Holiday Hounds on Parade, the Light Up the Night Fun Run, Children's Story Time with Mrs. Claus, the Ida Christmas Mall and craft and vendor show. Fine foods are available throughout the downtown district by food vendors serving American, German, Italian, Mexican, Cajun and Polish food supplemented by local organizations serving sandwiches and meals. The village of Ida is located in Southeastern Michigan between Monroe, Dundee and Temperance, Michigan. Ida is a rural community with a population of 5000.